This past weekend I got to experience being a mother to a brave little girl who decided she wanted to fight her own battles. A few months ago, one of our instructors approached us about wanting to run a small kids tournament to help familiarize them with sport rules and share a deeper love for the game. Our instructor, Cindy, is a well-seasoned competitor herself and did a phenomenal job organizing all aspects of our event. She created the opportunity for me to come and just be a mom to my tiny fighter. I wasn’t there to wear five hats — I am so thankful. I didn’t think I would be in this position so soon. 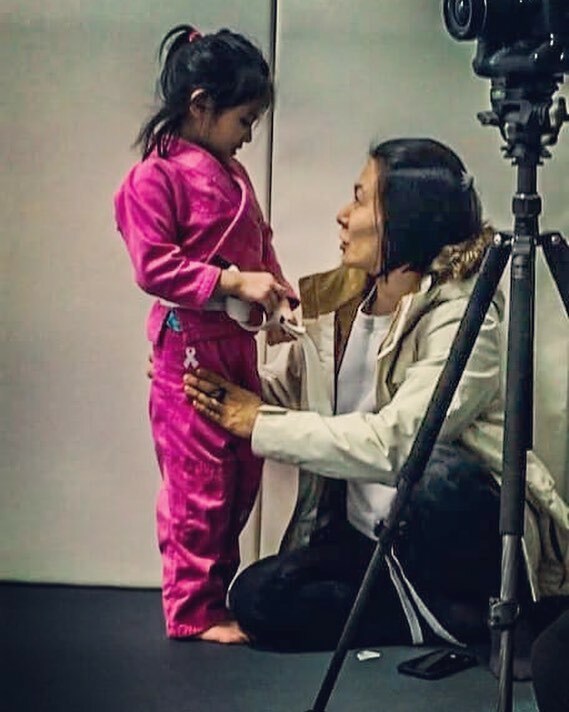 Saya is on the younger end of being 5 years old and it wasn’t until this past September that she even liked Jiu Jitsu. We tried to bring her in for class last year but she told me she didn’t like it because she was too small and couldn’t run fast enough to keep up with the other children. 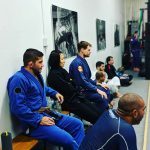 I chose not to make an issue out of it because although there are plenty of lessons I’d love her to learn from training BJJ, I figured I should let her gravitate to it naturally. In order to make a habit of training, I bribed her — no shame! She wants to have a lemonade stand at the school so she can make some money for herself to buy toys and to donate money to children who might not have money to buy the toys they want. I told her if she wants to do that, she better train a little more at the school first. We made a deal that she would come for 1 class a week for 5 weeks. We are way beyond that now, so one of these days I’ll have to keep my end of the bargain and let her open up that stand. News of the tournament has been circulating in the school for a couple months, but it wasn’t until 2 weeks ago that Saya came out of class and said, “Mom, I want to fight in the tournament.” I was rather surprised. I hadn’t mentioned it to her at all because I knew most of the kids participating would be bigger and older. I didn’t want to potentially create another setback in her willingness to train. I let it alone to see if she would mention it again. She didn’t forget. So this time I poked around to see who was registered because if she was really going to do this I was hoping someone might be close to her size. I’ve seen firsthand that when an athlete isn’t prepared for the intensity and pressure of a competition that it sometimes causes them to quit. I really wanted to avoid that outcome. She was the smallest and youngest competitor at the tournament and it took everything I had to not say anything that might put pressure on her. I just let her take the lead and softly tried to support her drive. I left the coaching up to the coaches and silently watched from the sidelines as she battled on the mats. As I watched her get pressured and pushed, as much as I wanted to yell out what to do, or do it for her, I found my heart secretly glowing — because my little one wouldn’t stop fighting. I was watching her willingly take on a relentless attack for a prolonged period of time and she wasn’t backing down. I saw her get thrown to the ground and pinned, but then she’d stand up and try to fight back. I saw her learning how to compensate, attack and defend in real time. I saw a glimmer of her inner resilience and it made my heart sing. She wasn’t pleased that she’d lost both her matches, but she simply said she would work harder to beat them the next time. She hadn’t expected her opponents to fight back! On the drive home she asked me if I would help her train her takedowns tomorrow so she could begin preparing for the next fight. I said of course I would help her with anything she wanted. The delicate lesson I am learning is to let go and let Saya be who she needs to be. I think I’ve been trying to equip her with a sense of accountability and independence as I’ve raised her, but this was a big step. She was making a choice to do something that wasn’t easy and she was doing ok handling it. Moral Psychologist Jonathan Haidt spoke about children being ‘anti-fragile’ on a recent podcast with Joe Rogan and I couldn’t agree more. It’s hard to watch them fall, but so fulfilling when you witness them come back stronger. I’ve always been one to let her explore her surroundings so that she approaches the unfamiliar with curiosity instead of fear. I want my children to be able to adapt to changing circumstances willingly and embrace intensity because they feel confident that they can redirect it. I discovered today that allowing Saya to be uncomfortable, watching her struggle and not interjecting was allowing her to figure it out for herself and giving her the space to trust her external support system. She was out there fighting her own battle and doing alright. She didn’t need me. As adults we know that life is not a carefully choreographed routine. It can be volatile at times. Saya proved that she trusted herself and her surroundings enough to get through the moments of stress. Reflecting on the incredible young people who fought their hearts out at the tournament made me so proud. 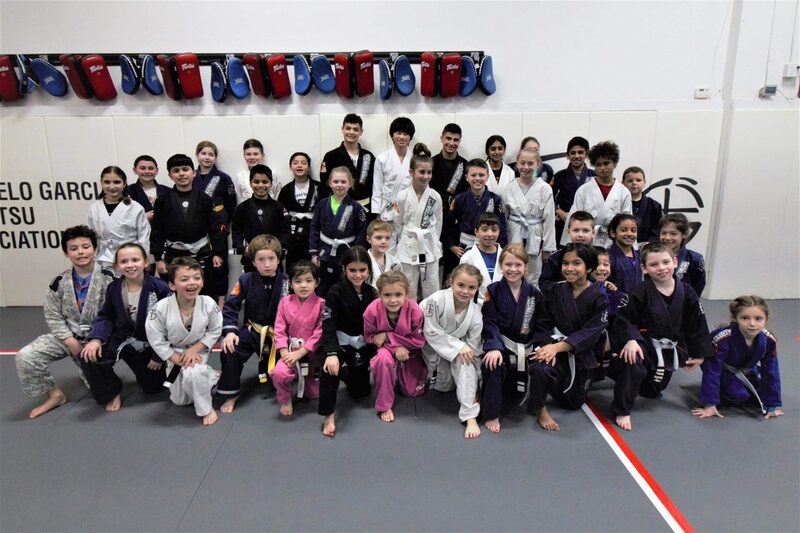 Every child that made the choice to get out on the mats wasn’t just fighting a jiu jitsu match, they were learning how to navigate internal and external stress in their world. THEIR world. Not mine, not yours, just theirs. This is one of the biggest tools we can give them because we won’t always be there to back them up. I want to sincerely thank Cynthia Fink for presenting us with this idea and pulling the event together. She had the help of our staff and students who kindly gave up hours to make this vision come to life. I also want to thank all our parents who are such an integral part of our community. They were all so supportive of the event and their children. We together, have successfully cultivated a positive and safe place for our children to learn these life skills. 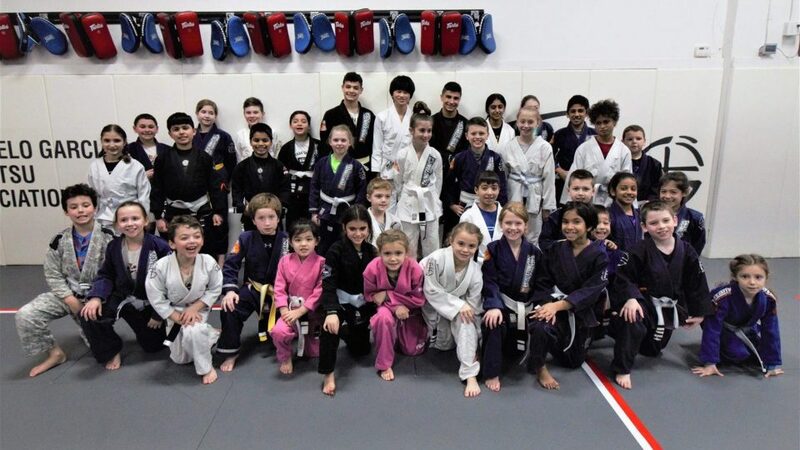 And to our little warriors — I think I can speak for the entire BJJ community when I say that you inspire all of us and help us believe that the world will be a better place because of you. Progress and Purpose: Why do we Train? 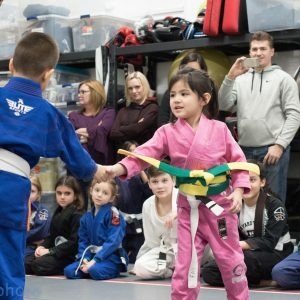 As a Mom and a martial artist who owns a school, I have to agree it’s important to let our children find their level of involvement with martial arts on their own. My sons were 7 and 15 when we opened our family’s school. They had been involved with Shotokan Karate previously and and continued training in Shotokan as well as in Jiu Jitsu. Over the years they both Took breaks on their terms. My younger son took almost a whole year off from training when he was 12. It was hard for me to be silent when I thought he should be taking advantage of the opportunity to train at our school, but as it turns out his will to train gain came from inside him and with no pushing from me. My sons are grown now, 28 and 20, they both have achieved much in their martial arts careers, as students and teachers. I am very proud of both of them, but mostly I love that they had a choice about their level of involvement with the family business. As children of a school owner they had little choice about being here when they were young, but they did have the choice about which arts they would train in and if they wanted a break for a time. Congrats to Saya for being brave enough to step into competition and being a good sport about losing. Thank you for taking the time to write this thoughtful comment. Our little people teach us so much about life. Appreciate the work you are doing in your community! !